Chanteuse Country US née le 21 Juin 1972 à Mobile (Alabama). Allison Moorer est la soeur de Shelby Lynne. Allison Moorer was born into a musical family and raised in the small southern Alabama town of Frankville; when Moorer's father shot her mother and then turned the gun on himself, older sister Shelby Lynne -- soon to become a country singer herself -- took charge of raising Allison. After attending the University of South Alabama, Moorer moved to Nashville, hoping to get her start as a studio backing Vocalsist. She struck up a songwriting partnership with musician and future husband Butch Primm, and soon signed a publishing deal. Performances of Walter Hyatt's "Tell Me Baby" at benefit shows for the late singer's family landed Moorer a contract with MCA Nashville. 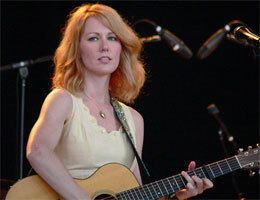 Moorer's big break came when "A Soft Place to Fall," a track she had co-written with Gwil Owen, was tapped for inclusion on the soundtrack of The Horse Whisperer; it garnered rave reviews, as well as an appearance in the film itself for Moorer, and set the stage for the singer's 1998 debut album, Alabama Song. She returned with another solo effort in 2000 with The Hardest Part. Two years later, Moorer had a new deal with Universal South and released a third album, Miss Fortune, later that summer. Show, which was recorded in January 2003 at Nashville's 12th & Porter, appeared in June. Her sister and Kid Rock joined Moorer for this first-time live recording. Not slowing down, Moorer found a new label home with Sugar Hill in early 2004. The Duel, recorded with a new studio band in less than two weeks, was released in April of 2004. Moorer married singer/songwriter Steve Earle and moved to New York in 2005, and in 2006 released Getting Somewhere. She followed it with a long tour, opening for Earle and being a featured Vocalsist in the Dukes. Mockingbird, her next offering, was released in early 2008. In 2009, Moorer appeared in The People Speak, a documentary, directed by Anthony Arnove and Chris Moore, based on Howard Zinn's landmark text A People's History of the United States. She also performed on the BBC television program Transatlantic Sessions and began recording a new album. In February of 2010 she released Crows on Rykodisc, and gave birth to a son in April and diagnosed with autism 23 months later. Moorer and Steve Earle separated in 2014. Her eighth studio album, Down to Believing, was issued by E1 in the spring of 2015, produced by Kenny Greenberg. Back in 2010, Moorer and Lynne teamed for the Side by Side tour, and considered recording an album together. The plan was shelved until 2017 when they got together in Los Angeles with producer Teddy Thompson and a small group of invited guest musicians including Benmont Tench, Erik Deutsch, Doug Pettibone, and Val McCallum. The siblings chose to record a host of covers from the classic country canon, alongside contemporary fare by pop and Americana songwriters. Their lone co-written original was the set closer "Is It Too Much?" Titled Not Dark Yet, the album was released by Thirty Tigers in August. 01/1998 SP MCA MCAS7-72030 (US) . 08/1998 SP MCA MCAS7-72069 (US) . 11/1998 SP MCA MCAS7-72077 (US) . 02/1999 SP MCA 088-172172-7 (US) . 12/2000 SP MCA 088-172192-7 (US) . 03/2000 CD MCA 088-172265-2 (US) . 2009 CD RYKODISC PRCD 000060 (US) .